What to do when you break your arm? We are two lovely (according to our supervisor) EM-residents from Medical Centre Haaglanden, The Hague and Erasmus MC, Rotterdam, working at the Sint Franciscus Hospital, Rotterdam for a month to increase our ultrasound skills. We expected to perform e-FAST and cardiac ultrasound a lot, but instead our supervisor sent us several times to all those broken bones. The first time I performed an ultrasound, I put up my glasses, but couldn’t see anything except a white line, but my supervisor told me ‘bone is blinding’, so that’s okay! 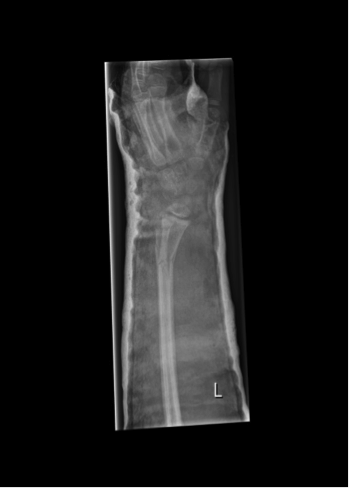 The following days, we saw a great number of patients with broken bones. Inhabitants in this area are not so steady (not to mention the amount of patients with drug abuse) and fall quite easily apparently, which was great for our ultrasound exposure. Therefore we will show you some beautiful ones (not patients but ultrasound images) below. 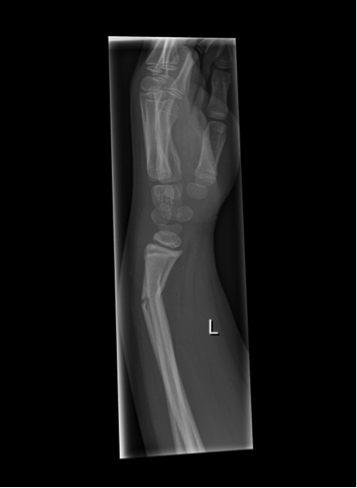 Case 1: What will happen when a 7 year old decide to fall from her bike and there is no ultrasound addict available, because he is performing PSA at her with propofol. Fig 1en 2. An incomplete reposition at the emergency room, followed by reposition at the operating room next morning was the unfortunate result in this case.